Here’s a chart that I mentioned last week when I wrote that the VIX had spiked higher but not high enough. It is a slightly different way of looking at the volatility measure. Instead of looking at the value of the VIX, in the chart I’ve plotted the value of the volatility index relative to its own 50 day moving average. When the VIX goes higher it is important to be able to somehow measure if it is “high enough”. The most obvious way is to compare the VIX reading to past readings but as you know, over the long term, volatility cycles through high and low periods. What was considered high at one point, may not be high in another. 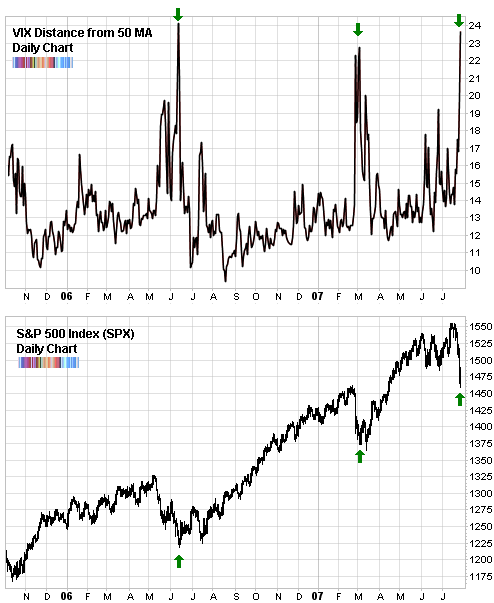 Case in point, the 2002 bear market bottoms saw the VIX reach 45 but since then we’ve been finding volatility “high enough” (to point out a bottom) in the 20’s. By comparing the most recent reading in the VIX to the average of its most recent 50 consecutive readings, we can get an idea of how high volatility is compared to its most recent behaviour. So this tells us that yes, we are really seeing a significant increase in volatility and therefore, the chance of a significant inflection point being around the corner is high. But - there’s always a but! - notice that almost all significant market bottoms have a retest of the low within a short period of time. This was the case in the spring correction as well as the summer correction in 2006. My point is that you don’t need to rush in and buy at the first glimmer of panic. If this is a real inflection point, it will be apparent soon enough and it may even follow the same script by retesting its lows.